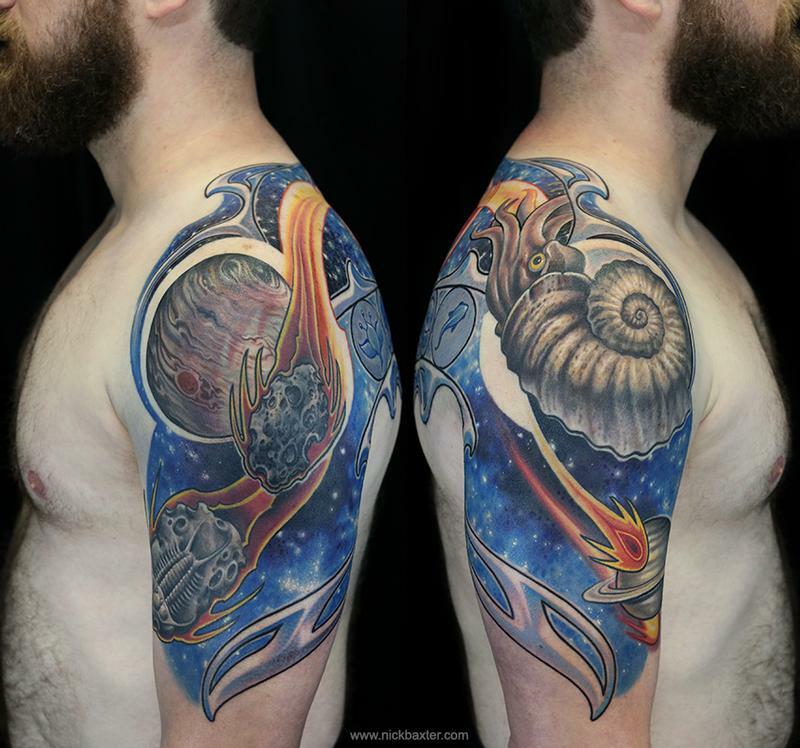 David came to me with an interesting request for a shoulders and arms wraparound tattoo depicting the origins of life and ancient fossils. This project also involved a small coverup on one arm (you can see the back portion in the previous gallery image). I came up with a design influenced by Art Nouveau and the bold, high contrast color style of comic books that shows the Big Bang shooting forth through space the origins of life on our planet, in the form of ancient fossils and sea creatures. Two Nouveau inspired sequences depict the life cycle of plants and animals with the iconic fruit and tadpole examples. This tattoo was a lot of fun conceptually and artistically, and we hope to add more of the story of life and evolution at some point.